Huge update for your Open Positions! We’ve added some great new charts to the Open Positions page! 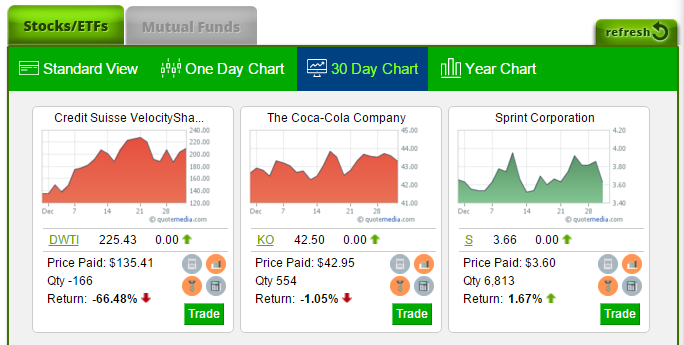 Once you’ve purchased any stock or ETF, you can view your portfolio as a series of charts showing each stock’s performance. You can switch between the day’s change, for the last 30 days, or even the whole last year. Best of all, the charts are color-coded: Green if you’re making money and red if you’re losing it, so it is easy to see what is making your portfolio move the most. Besides the awesome new charts, we’ve made some huge improvements to the Pie Chart on the right side of the page. 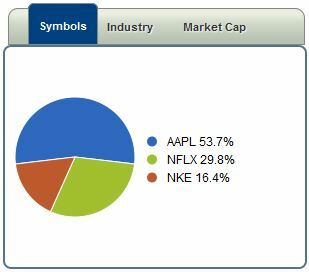 The Pie Chart will now show how your portfolio is split between different stocks, how it is split by industry classification, and even how much you’re investing in big companies compared to small ones (“Market Capitalization”). The industry and market cap filters are provided by our data provider, and will continue to improve as we move forward. However, if you’re new to HowTheMarketWorks and want a quick way to get started, we’ve also made an improvement just for you: if you don’t currently have any stocks in your portfolio, we will give you a rotating list of the most popular stocks trading right now (with the company logos and current day’s price movement). It has never been easier to manage your portfolio, so check it out today! As always, there have been tons of small changes, bug fixes, and performance improvements put in place every week. At this time, we have stopped further development of the old version of the site. New users and classes are encouraged to register on the new site, which is still found at new.howthemarketworks.com.